Meet the new standard by which all short telephoto lenses will be measured against, the world's first* full-frame 105mm with an f/1.4 aperture. A marvel of optical precision, distortion correction and craftsmanship. It's fast maximum aperture make this an ideal optic for available light—recommended for portraiture or indoor sports. This short telephoto lens can defocus backgrounds with painterly finesse and isolate subjects with three-dimensional fidelity. For those seeking the ultimate in image quality in photography or videography, there's no close second. 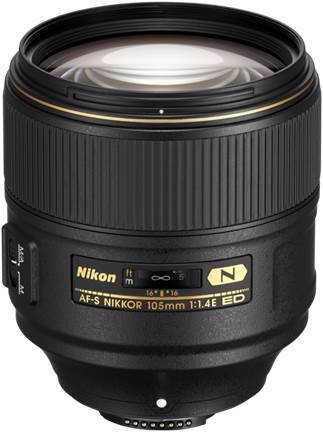 An excellent performer for available light, the AF-S NIKKOR 105mm f/1.4E ED also excels when using Nikon Speedlights—indoors or out. Create beautiful portraits with minimal depth of field as well as using Advanced Wireless Lighting with Auto FP High Speed Sync. Its f/1.4 maximum aperture and nine-blade diaphragm produce a superior bokeh effect with large, smooth spheres with gradual alteration. The focal length (105mm on FX cameras, 158mm on DX cameras) creates an ideal working distance that's close enough to interact with the subject. This is the culmination of Nikon's expertise in lens design, optical excellence and industry leading innovation. Its new optical design creates ultra-high definition across the entire frame, especially when used with one of Nikon's full-frame (FX) high-resolution DSLRs. Its a lens that pushes boundaries of imaging possibility, one that can take your photography and videography to a thrilling new level. What will you achieve with it? Chromatic aberration, ghosting and flare is minimized by three Extra-Low Dispersion (ED) elements. Nano Crystal Coat (N) outperforms conventional antireflection coatings over a broad wavelength range for maximum contrast. Like the AF-S NIKKOR 58mm f/1.4G, point light sources are reproduced naturally without sagittal coma flare and minimized astigmatism, even at the frame edges. An electromagnetic diaphragm (E) maintains consistent exposure during high-speed capture, while fluorine coat ensures a lifetime of brilliant performances.